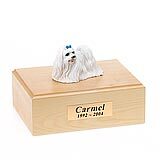 "It's been hard and I guess every time I talk about Hobie's urns I have to think about putting him down all over again. I had him for eleven years-he lived indoors with me, but loved outside and the water. He had cancer as well. I have lots of human friends, but he was definitely the best friend that I've ever had. I told a friend this morning that when I see people walking their black labs I almost wreck staring at their dogs and thinking how lucky they are to have them! Anyhow, I appreciate your concern and thank you for your personal message. I hope it gets easier for you as well." 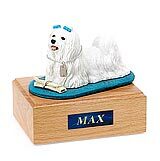 All available Maltese dog urns and memorials will be displayed with the figurine on the Maltese urn you select and in the appropriate size. 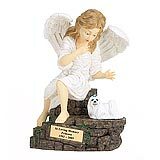 This figurine not available on the Angel Edition.